The graphic designer and film animator Raimo Raimela studied at the Central School of Arts and Crafts from 1936 to 1939. He was in active service during both the Winter War and the Continuation War. In 1942 he was seriously wounded in action, and that came to affect his entire career. As a convalescent, Raimela received orders to begin service with the Armed Forces’ department of photography. His career within filmmaking began in 1943 with a study trip to the UFA studio in Berlin, where he learned how animated films were made. He applied this knowledge to his military training films and later, in collaboration with Professor Yrjö V. Paatero, to Paatero’s X-ray research. After the war foreign films started pouring in to Finland and Raimela proved to be the right man both for drawing posters and for making the film placards that were hung outdoors. He and his colleague Osmo K. Oksanen were responsible, among other things, for providing several metre-high, hand-painted film advertisements which stood on the roof of Cinema Rex in Helsinki. 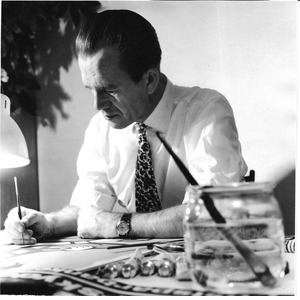 In 1955, Raimo Raimela received two different first prizes for his posters, Poster of the Year and Film Poster of the Year. He also won the latter competition in 1957 and in 1958. He also created several award-winning works for, among others, the Finnish Red Cross. As early as 1944, Raimela opted to work as a freelance artist. Apart from the usual graphic work, Raimela, who was a practical man, devoted some of his time to the planning and building of exhibition cases. The Finnish bank, Postipankki, commissioned Raimela on several occasions. For many years he did everything from designing forms to be part of planning of bank offices. 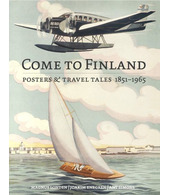 Raimo Raimela also created a series of unique advertising posters for Postipankki. While making these, he started by creating miniature models which he cut out from paper. He then photographed the models and created posters giving his audience a three-dimensional experience. The versatile Raimela also designed neon light displays. One of his commissions was to plan the neon light display for the new commercial building in Helsinki, the so-called Makkaratalo, situated opposite the main railway station. The building was completed in 1967. Raimela was also one of the founding members of the school of the Finnish Graphic Designers’Association, Mainosgraafikkojen koulu (MG). He taught and was also principal at the school from 1963, until the beginning of the 1980s.